For the last few years there has been a distinct lack of snow. In fact Chloe, at 5 years old, has little experience of real snow at all. The last time we had a fall significant enough to rock out the sledge, she was only a toddler and happened to be poorly that day. 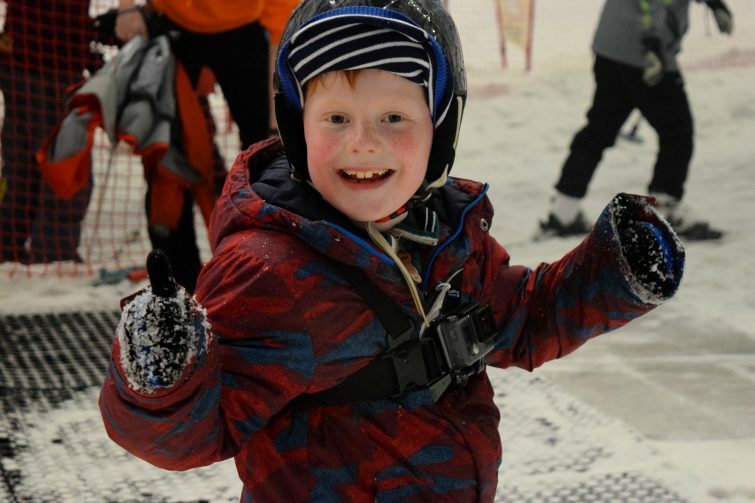 So, when the opportunity arose for us to visit The Snow Centre in Hemel Hempstead, I was keen to give it a go! Ok, I hold my hands up and admit it – I’m not a winter sports kinda gal. Ok, ok. I’m not a sports kinda gal. Not at all. Holidays for me are about sunshine and lazing by the pool. The idea of a skiing holiday really doesn’t appeal. Far too much effort for my liking. It will come as no surprise then that I’ve only worn skis once in my life . . . I was about 7 and went to a dry slope with Brownies somewhere in North Yorkshire! As such, we were all complete novices except Dave who used to snowboard well enough to have at least bothered to buy his own snowboard but that’s before I even knew him so I think it would be fair to say his skills are a little rusty. We had private family ski lesson booked – an hour long for Dave, Ben and Chloe and half an hour for Amy and I. Unfortunately, Dave and Amy weren’t able to come with us on the day so Ben, Chloe and I had an hour long lesson with a bonus instructor for the first half an hour! Of course, as ever, Ben and Chloe didn’t know what we were doing – just that we were going on an adventure and would be staying in a hotel. Our session at The Snow Centre was booked for 2pm so we set off at 8am giving us ample time to factor in a stop at services and lunch before our lesson. 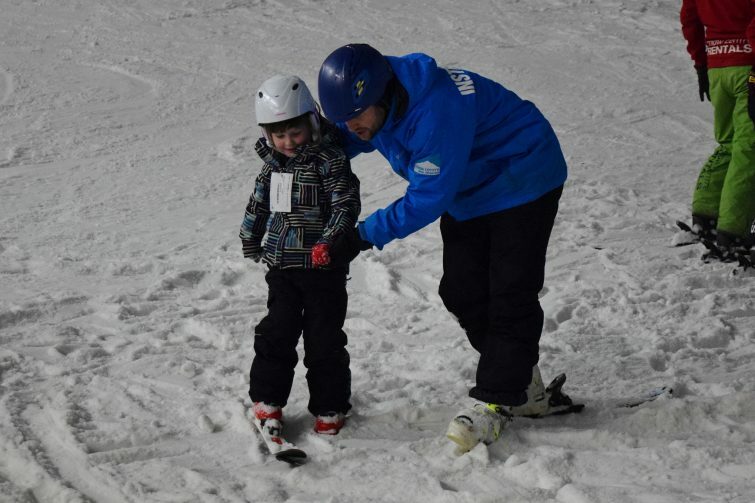 When we arrived at The Snow Centre and parked up, I explained to the kids what we were going to do – Ben was immediately excited (he’s such a thrill seeker) however Chloe was really nervous – I’m sure she thought I was just going to take her to the top of the main slope and push her down it! I explained to her that our instructors knew we’d never skied before and wouldn’t make us do anything scary. I went on to remind her that she was scared of the water slides at Splash Landings before she did them and that sometimes she just needs to trust me that it will be fun! 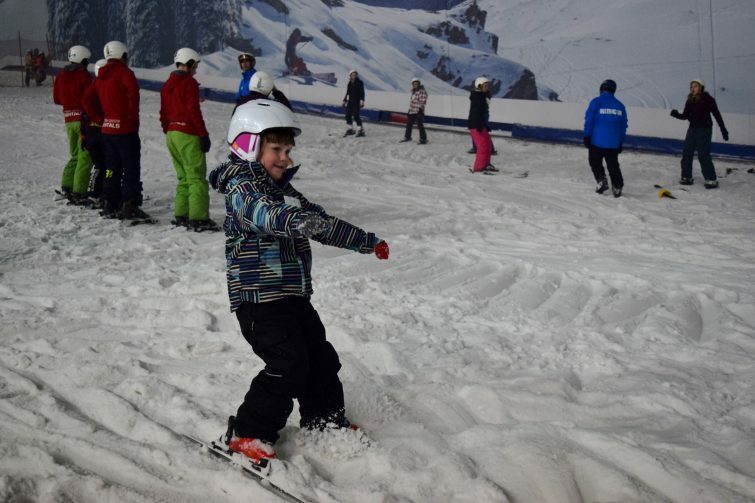 It’s worth bearing in mind that although our Snow Centre ski lesson was booked for 2pm, there’s a substantial amount of preparation required – we had to check in and then collect all our equipment. There is a clothing hire charge of £7 per person (which is of course avoidable if you have all your own ski stuff . . . we didn’t). The women’s ski gear comes up pretty small and I ended up having to wear the men’s equipment . . . stylish. Anyway, no matter – it kept me warm and dry which is the most important thing! Ben and Chloe were able to dress themselves fairly easily. (It’s worth bearing in mind that jeans are not a good idea of this kind of activity as they tend to get wet and heavy very quickly – I wore leggings and the kids both had tracksuit bottoms and hoodies on under their ski clothing) I had taken hats for us all to wear but this wasn’t really necessary as we had our helmets on and they kept our heads pretty warm (and obviously safe!). We took our own gloves, just standard woolly mittens for the kids and my leather gloves. 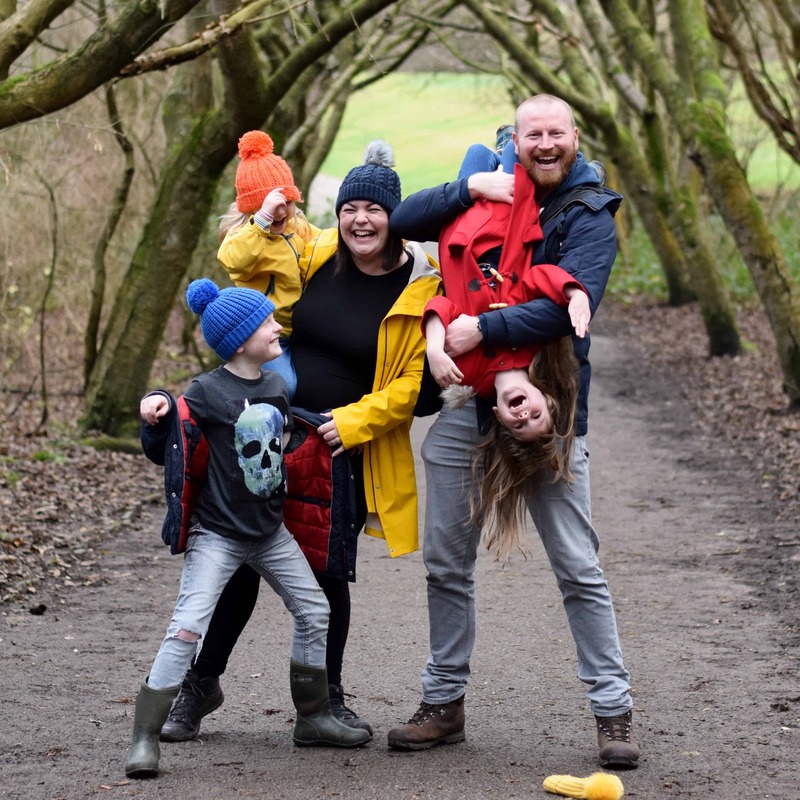 I realised afterwards that this probably wasn’t the best choice of equipment for the kids as their gloves were soaked through and their hands pretty cold but neither of them complained and it’s only an hour – no different to playing in the snow as kids ourselves I guess! Once we were all set with our clothes it was onto the rather more technical equipment of boots and skis. Ski boots are sized according to your shoe size and your skis adjusted according to your weight so it’s worth making sure you know those details ahead of time! Putting our ski boots on took forever – they are awkward and cumbersome to get your feet into and then tricky to fasten but this is nothing compared to how tricky we found them to walk in!! I’d also made the mistake of fastening up my ski jacket before I got everyone’s boots on so I was absolutely roasting by the time we were ready. 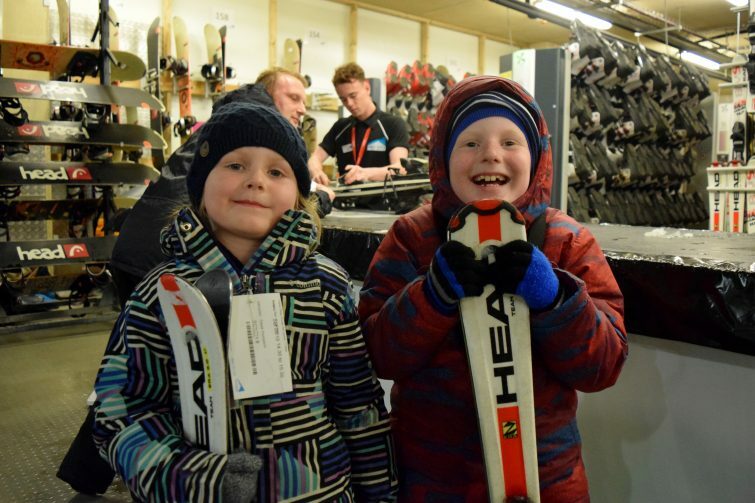 The guys at The Snow Centre helped us out with fitting the kids helmets and then I picked mine off a rack according to size – this involves a bit of trial and error to make sure you get a good fit. I must admit that the helmet was probably my least favourite bit of the day . . . it smelt all stale and sweaty, as you’d expect I guess, and I could smell it for the rest of the day! I think it’s probably the first thing I would look to purchase for myself if I was about to taking up skiing with any regularity. Finally, we were all suited and booted and set to go! We were met by Doug and Dave who had a quick chat with us about our previous experience (or lack thereof) and what we expected to get from our session. As I mentioned earlier we should only had have on instructor but because Amy hadn’t been able to come with us we benefited from an extra half hour’s tuition from her instructor. 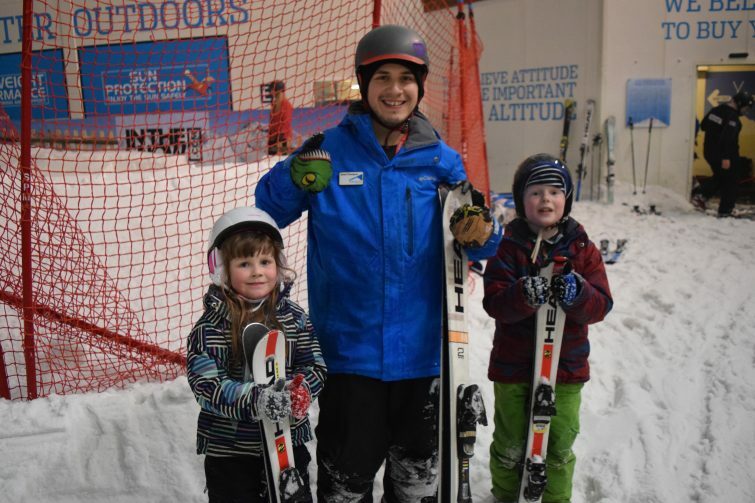 Doug and Dave encouraged Ben and Chloe to make animal noises and actions as they were going down the slope – Chloe got totally on board with this and made some great lion noises, Ben said I did a good job of being “a scared human” as I squealed my way down the slope! 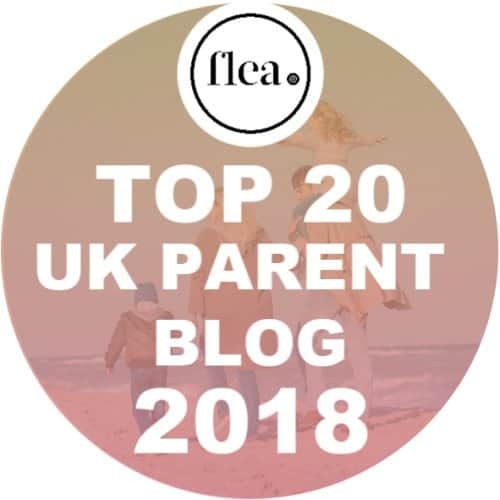 Once they’d had a few goes of sliding down the slope and climbing back up again, Doug left us for his next booking and Dave took us over to the travelator – which meant we could get a little higher up the slope but didn’t have to work so hard to get there! Now Dave had them doing “heads, shoulders, knees and toes” as they skied down the slope, or even jumping a little. He explained later that this was good for developing their balance and meant they weren’t really concentrating on what they were doing. Chloe thought it was hilarious! The hour passed so quickly but it was definitely just long enough. By the end of the session it was clear that the kids were tired, they were slower to get back up when they fell! They’d had a fantastic time but I knew they were ready to stop and have a rest! At the end of the session Dave sat down with us in the changing rooms and talked through the things that we had achieved and gave us a record card to show the levels we had reached. He said that both children had done really well and had got a lot done for their first lesson. I must admit I was particularly impressed with Chloe as she has a tendency to get quite frustrated when things are hard and isn’t always very good at laughing things off. 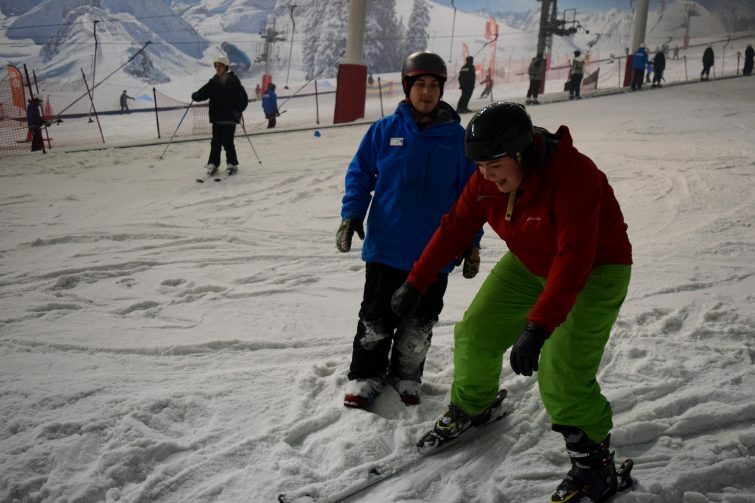 She loved her ski lesson though and just kept on getting back up and having another go. In fairness to her she spent less time on the floor than Ben and both myself and her instructor Dave thought she’d done incredibly well. 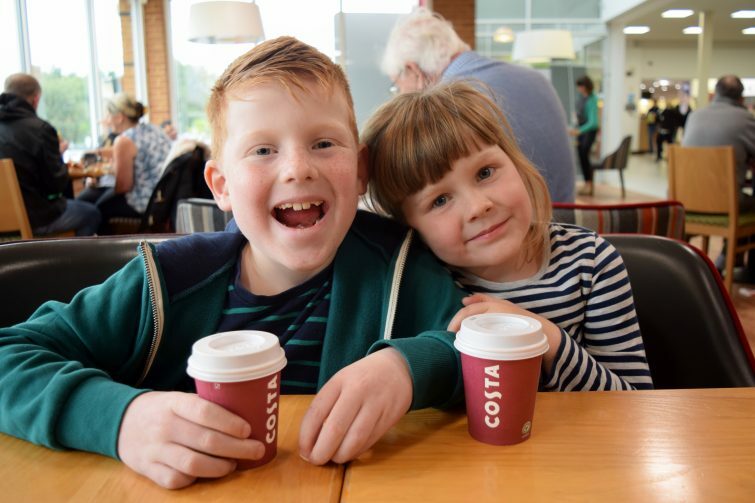 Once we had got changed and given back all our equipment we made our way upstairs to The Lodge where I had expected we would all want to warm up with a hot chocolate but actually we were all still really hot from our lesson and had a slush to cool down instead! 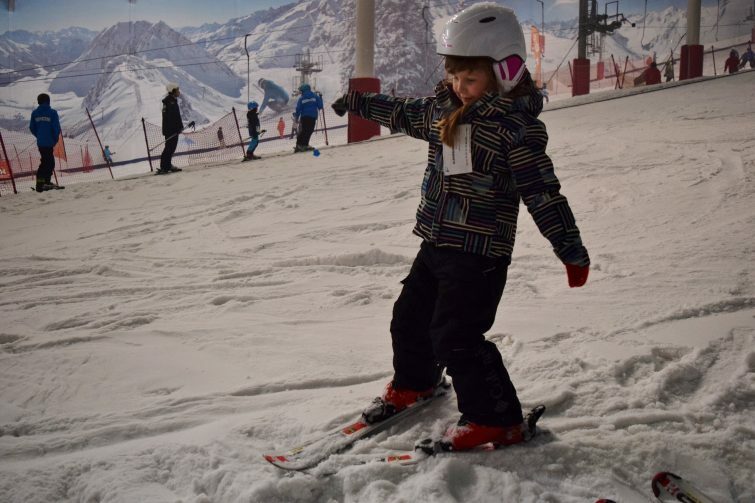 Ben and Chloe loved that we were able to look out over the main slope whilst we had our drinks and were particularly impressed with the snowboarders taking the jumps! 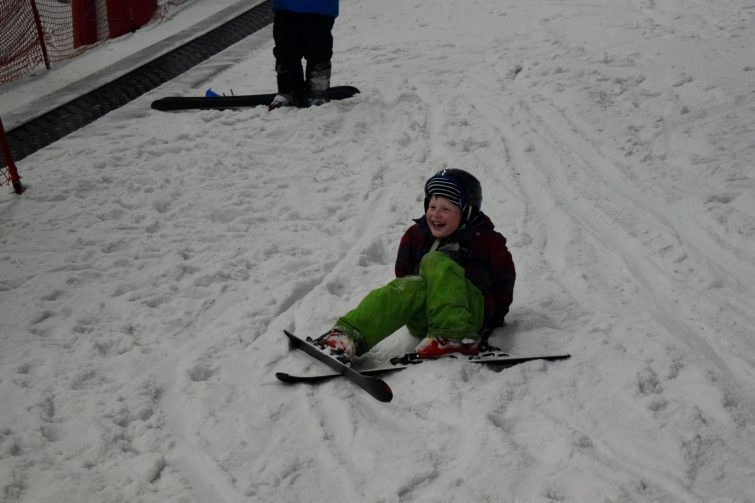 Ben said he quite fancies trying a snowboard next time! Both kids were absolutely buzzing after their lessons and have both said that it was well worth the effort of driving all the way down to Hemel Hempstead and are keen to have another go! I’m just gutted that Dave and Amy weren’t able to come and take part this time! It was such a fantastic experience Donna, I know you’d all love it! What a fantastic experience for you all. We love playing in the snow here too but, like you say, we just haven’t had any decent snow for ages. We’ve never tried skiiing though and this looks like a great way to get a taste of it. Poor Chloe! Glad she enjoyed it and got over her nerves, I think I would have been the same! Didn’t they do brilliantly? Kids have a natural advantage when it comes to not falling, it’s the lower centre of gravity. Clearly that’s the ONLY reason Flea can surf and I can’t. I was so impressed with them! Flea also has fit instructors to impress though ? Looks like you all had a great time, your kids managed to do so well in such a short time. The Snow centre is very close to me, I may have to take my family 🙂 I’ve never skied in my life but my boyfriend has snowed boarded too. Thank Lucy, they really did learn a lot in that hour thanks to their instructors! Skiing is something I’ve never really fancied either, but since I took the boys to our local snow, er, place I’ve quite fancied having a go. I think as adults we find it very easy to put off trying new things like this. 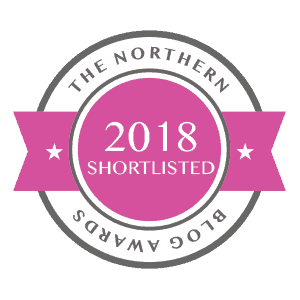 Maybe it’s time I bit the bullet – you look like you had a lot of fun! Every winter I hope we might get some proper snow but it doesn’t seem to happen does it! Thanks Jess, I loved making that video! Looks like they had a great time and well done to Chloe for trying it and then giving it a good go. My husband likes snowboarding so I’m now thinking he should take my two to something like this as I can see them loving it. I was really pleased with her for giving it a go as I thought she might just refuse! This sounds like lots of fun!! I enjoyed reading your in depth review. It sounds like a lot of faffing putting all the gear on, I would be tired before I got on the slope haha. 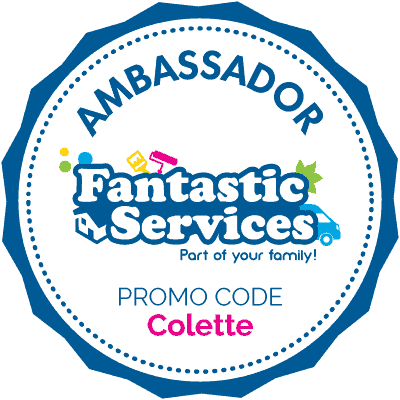 It sounds like a great thing to do for a one off family treat such as a birthday as I can imagine it being very costly going frequently. Yes, just getting dressed was exhausting – and so hot! I agree, definitely an expensive hobby though you’d be able to reduce the cost by not having to hire clothing each time. This looks like a brilliant experience! I’ve skied a few times and loved it and I’d love to introduce the kids to it. Yuk about the sweaty helmet tho! 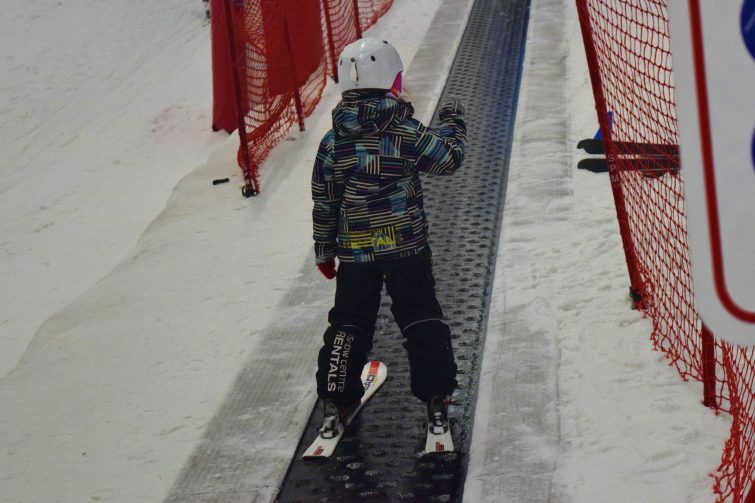 Oh wow this looks awesome, Chris loves snowboarding and I think he would love to take little Finlay on something like this when he gets a bit bigger – They are both adrenaline junkies! My husband snowboards here! He’s after me to go and give it a try but i’m not sure i’d enjoy it, looks like your tribe did though!